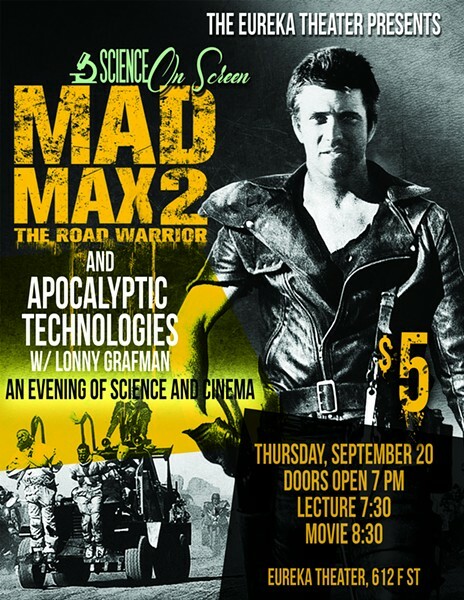 This event will pair popular cinema with the real-science of how to survive, or maybe even prevent, an apocalypse. Directed by George Miller, The Road Warrior continues the story of Max (Mel Gibson), a loner in a dystopian wasteland where survival relies on scavenging and killing for Earth’s scarce resources. When he stumbles upon a small community in trouble, Max agrees to help them. But he’s just there for the gasoline. The feature film will be preceded by a presentation from Lonny Grafman on sustainable technologies. Lonny Grafman is an Instructor of Environmental Resources Engineering and Appropriate Technology at Humboldt State University, Founder and President of the Appropedia Foundation, and the Advisor for the epi-apocalyptic city art projects, Waterpod, Flock House, and WetLand. Lonny has led teams all over the world assisting communities with sustainability projects including the use of solar power to improve cookstoves, micro-hydro power, rainwater catchment, and constructing plastic bottle schoolrooms. He believes the most vital component to sustainability is community.